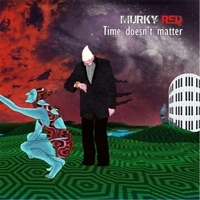 Murky Red is a Belgian rock band formed in the autumn of 2010. The band delivers a blend of different rock styles, influenced by bands such as Led Zeppelin, Deep Purple, The Doors, Steppenwolf, The Rolling Stones, Fleetwood Mac, Band of Horses, Pink Floyd, The Dire Straits,... and artists such as Gary Moore, Mark Knopfler, and Snowy White. Music fans have been blessed this year with some truly amazing music. That being said.... we cannot ignore this wonderful and long awaited release. It is like a rare butterfly who has finally decided to settle on your finger. Many groups have done their fair share of the blues; however this is far more Murky Red. You will surely have your own opinions regarding your favorite tracks and which songs sound like so and so. Have at it my friends. I prefer to enjoy and just share my general thoughts. It would be unfair and unlike me to label Red with a genre. It is too diverse to label it with a sub-genre. The album is brilliantly laid out... so do make time to listen. Once you start... I believe you will find it difficult to stop. It’s like listening to your favorite artist for the first time. It will leave you absolutely mesmerized and wanting more. This reviewer sincerely hopes to get an encore (album) from Red. From the musicianship to the production and the creativity... I find it difficult to find any fault. After four listens all I’ve accomplished is noticing that my favorite track keeps changing?. These musicians give all their heart. It’s right out there for all to see. This is what music and art are all about. Sharing and expressing one’s self! You can hear their joy through the pain. It is magnificent to feel goose bumps when something truly moves you. The tasteful vocals add just the perfect amount of description and soul. The bass makes me wonder “how can I top that”. The song writing is very well thought out (although for all I know they did it without any effort which wouldn’t surprise me). All of the musicians deserve proper credit. I will tell you that I hear hints of some of my favorite bands (new and old). Whether they are an intentional homage or just what I think remains a mystery. I like mysteries! Please feel free to discuss this amongst yourselves over some coffee or whatever you may fancy with your tunes. This album flows together like classic Floyd in the sense that the changes mid-track and between tracks are stunning and seamless. From dark to light and from mellow to ‘stand up and shout!’. This is must have material and I want my copy signed ASAP! Please just come to it with an open mind and really good headphones. You will be giving yourself the best holiday present of the year! Thank you all Murksters...Members: Stef Flaming, Tom Kockelmans, Patrick Dujardin, Joery Masson, Yolanda Flaming, Marie Vancamp! This is classic rock of the highest calibre! I am not a reviewer but this band came out of nowhere and MUST get heard. I am not a fan of straight rock or anything too narrow. I do love very nasty music like Pain of Salvation and Dream Theater but the greatest applause must go to the real musicians who enter millions of lives and stay forever. Clearly that is not boy bands or instant gratification music. It is Beatles, Stones, Floyd, Queen, Bowie. Shall I go on? If you want a clue as to the sound of Murky Red, then I can say they touch on Dire Straights, Roxy Music, Pink Floyd, Black Sabbath. They clearly are not aware of this, so are not copying or trying to hit a market. This is music for fun and OMG does it hit home. Black Beast Rising is astonishingly powerful. I am a guitarist and have no idea how he gets that sound. Saturn never stops reminding me of Ladytron from the best era of Roxy Music. It is brilliant! My favourite could be "It's Cold outside". By the time you are 5 minutes into that song, you will want this album. See if I'm right! The other tracks? Hit the sample button and you'll hear. This is no one trick pony! Murky Red are a band led by the couple Stef and Yolanda Flaming. They tried to create a music deeply rooted in the "occult" heavy-rock of the seventies, yet with touches of blues-rock, gothic rock, space-rock, southern rock, a dash of heavenly pop and a modern approach close to stoner rock. Despite the large amount of influences, they managed to create a world of their own. This track-by-track review will help you palpate their music and how they articulated their influences through the album. The opening track starts off as a boogie rocker with frequent mood and rhythm changes. Best comparison would be Stooges, but also Nick Cave's Grinderman for recent acts. Vocals are quite reminiscent of Nick Cave as well, and the league of gothic cabaret/gothic rock of the eighties, and for recent acts, the drummer/vocalist of electro-psychedelic rock band zZz, Björn Ottenheim. To the fury of the Stooges-inspired music succeed floydian atmospheres with aerial guitars and synth notes repeated at regular intervals. A dark-ambient mood opens the second song, with slow guitar touches, slide guitar and soft piano layers. Then some "muddy" guitars and solid drums enter and the whole sadness is tempered by organ layers. A virtuosic guitar solo followed by raging guitars conclude the track. "Galadriel" retains a strong Black Sabbath feel in its overture ("Iron Man" comes to mind). Some keyboard-generated choir makes the link with the heart of the song, where "gothic" vocals melt with insisting guitars. Hypnotic guitars echo Adrian Smith of Iron Maiden in the chorus. The short gloomy passage after first chorus, with sinister guitars switching from left to right speaker and vice-versa, tympani-like drums and choir, provide a dark symphonic feel to the music, not far from Therion. Then a more enthusiastic guitar solo follows and the chorus extends until the end of the song. Floydian music with bluesy guitars follows in "cold outside". A discreet Hammond with sunny guitars give positive vibes to the song in the first verse. Guitar solos are aerial, in a Gilmour way, during the first part of the song. Piano replaces Hammond during the second verse, and the guitar will remain in a blues vein until the end of the song. "I give you my soul" : Heavenly female vocals in this song where Pink Floyd (the slow pace and overall quiet feel) meets Led Zeppelin (rhythm guitar reminiscent of Jimmy Page in „stairway to heaven”). Male vocals join in the chorus. An aerial guitar solo bursts before the song closes with near-whispering vocals. "Saturn" retains a hypnotic vibe with echo effects in piano, and vocals in its preamble. It segues into more aggressive territories with hard-rockin' guitars. The hypnotic effect remains in the echoing guitars of the chorus. A transitory keyboard reminds the introduction to Rush's "Tom Sawyer". The mood is quieter, almost eerie with the floating keyboards. This is the calm before the storm, as the music becomes even more aggressive than previously, with a faster pace. It ends in a dark-ambient mood. "Last chance hotel" is a dynamic boogie southern rock song that presents nonetheless with a stoner rock side when the pace slows down in the middle of the song. 8 "Willow Tree": Heavenly female vocals (both as lead and in the choir) for this dreampop song. Male vocals interfere discretly in the chorus. Guitars give it a blues feeling. Ambient keyboards open the ninth song ("boots for hire") then a guitar solo settles, reminiscent of Brian May in "Bijou" over a doom-metal background, soon followed by some fast "hopping" southern rock in the bridge. The eerie ambiance of the doom-metal of the debut returns to close the track, but in a dark-ambient wrap this time. "Heal my bleeding heart" is a song with a dark-light atmosphere in the line of Pink Floyd's "In The Flesh" (or the whole 'The Wall' for the matter) where Hammond soars in the chorus. Gilmouresque aerial guitar solos punctuate the verses. An imploring vocal opens the last track "black beast rising", like in a Middle-Oriental religious chant. The song then evolves towards floydian territories, with slow pace, and sustained Hammond all along. Some "jerky" guitar touches can be heard in-between the aerial solos that conclude this album in a space-rock atmosphere. Overall, this album is a nice aural trip, and a good mixture of all that's done in the past 40 years in rock music.